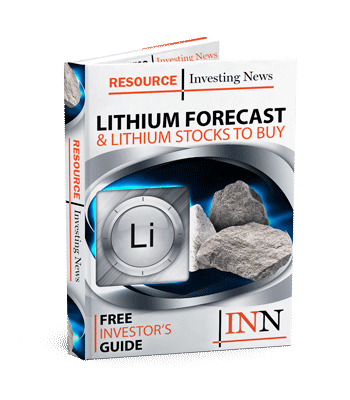 Eight Capital analysts David Talbot and Joe Fars recently suggested four lithium stocks to watch this year. Here’s a brief overview. Lithium continues to be a hot commodity, with news about electric vehicles (EVs) dominating headlines worldwide and prices for the metal trending upward. In fact, battery-grade lithium carbonate prices are forecast to average $13,000 a ton over the 2017 to 2020 period from around $9,000 in 2015 to 2016, according to Benchmark Mineral Intelligence. Lithium hydroxide, also battery grade, is expected to average $18,000 a ton between 2017 and 2020 against $14,000 from 2015 to 2016. Many lithium stocks have fared well alongside lithium prices. Eight Capital analysts David Talbot and Joe Fars recently listed four that they will be watching this fall, noting that they remain bullish on lithium and other battery metals, such as cobalt and graphite. They see price support for lithium coming not only from supply chain industry players, but also from governments. For instance, earlier this year, France and the UK outlined plans to ban all sales of fossil fuel cars by 2040. More recently, China, which leads in the EV space, announced similar plans for the near future. “This is certainly positive for the battery mineral space overall as we see China to show the largest growth in the EV cycle,” the analysts said. Another factor to pay attention to is the declining cost of EV batteries, which will support electric car adoption rates. According to the analysts, the industry remains committed to targeting further reductions in order to make EVs cost competitive with internal combustion engine-based vehicles. Read on for a look at the four lithium stocks to watch identified by Talbot and Fars. All stats were accurate at close of day on September 14. Nemaska Lithium is focused on becoming a supplier to the lithium-ion battery market. The company’s wholly owned Whabouchi spodumene mine project is located in Quebec, and is estimated to be the second-richest and largest lithium deposit in the world. The company’s plan is to ship spodumene concentrate from the mine to its lithium compounds processing plant, also in Quebec. Click here to read our recent interview with Nemaska Lithium CEO Guy Bourassa. Lithium Americas, together with SQM (NYSE:SQM), is developing the Cauchari-Olaroz brine deposit, located in Argentina. Lithium Americas owns 100 percent of the Lithium Nevada project as well, and its subsidiary RheoMinerals is a supplier of rheology modifiers for oil-based drilling fluids, coatings and specialty chemicals. Orocobre is building a substantial Argentina-based industrial chemicals and minerals company through the construction and operation of its portfolio of lithium, potash and boron projects and facilities. Orocobre’s operations include the Olaroz lithium-producing facility in Northern Argentina, Borax Argentina, an established Argentine boron minerals and refined chemicals producer, and a 35-percent interest in Advantage Lithium (TSX:AAL,OTCMKTS:AVLIF). Advantage Lithium is a resource company specializing in the strategic acquisition, exploration and development of lithium properties. The company has acquired 100-percent interests in five projects in Argentina and up to a 75-percent stake in a sixth. Orocobre is Advantage Lithium’s partner at its flagship Cauchari project, and as mentioned is also one of the company’s major shareholders. Additionally, the company is earning an interest from Nevada Sunrise Gold (TSXV:NEV) in a portfolio of five lithium brine projects in the Clayton and Lida Valley regions of Nevada. Click here to read our recent interview with Advantage Lithium CEO David Sidoo. Editorial Disclosure: Advantage Lithium, Nemaska Lithium and Nevada Sunrise Gold are clients of the Investing News Network. This article is not paid-for content.